Available now, the Protect PA is the first static rope that has no sheath slippage thanks to Platinum(R) technology. New England ropes is using a new braiding method to keep the core and the sheath together. Instead of gluing or taping the sheath to the core, New England Ropes has developed the technology to weave the sheath and the core together every 60cm. I took some liberties with the rope product catalog photos. Quick Aside: New England Ropes has technically changed their name to Teufelberger according to the NEropes website. Their dynamic climbing ropes will stay under the Maxim brand name. Since this is a static rope and nobody has yet to hear of Teufelberger, we’re sticking with the New England Ropes name for clarity. This new braiding technology eliminates sheath slippage as the sheath and core are effectively tied together. Traditionally, when a core fiber is broken, it renders that entire strand useless from that point on. 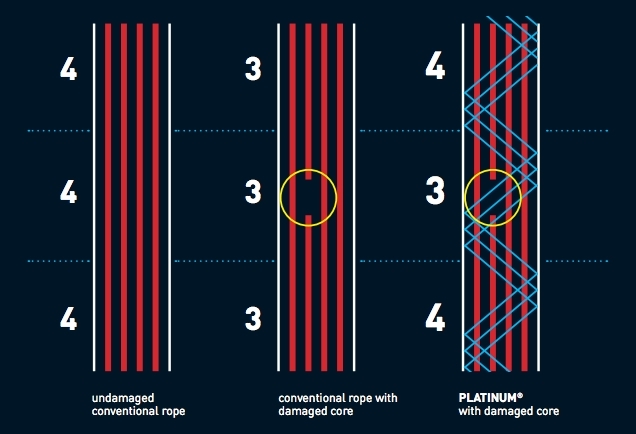 With Platinum(R) technology, less than 60cm of that strand is considered broken. This image is from the Platunum(R) technology product catalog. In addition to the lack of sheath slippage, there’s another added benefit: in-use, the load is spread more evenly across the rope so we should be seeing higher strength numbers. This is because the core strands will now share the load with the sheath as they are able to reinforce one another. The Platinum(R) product catalog also claims this method will create better handling and a longer life. Admittedly, I’ll be waiting for the dynamic version, but if you’re hauling, bolting, or route-setting, this would definitely be a static rope to consider. It’ll also be great in high abrasion and wet areas, and may add extra mental comfort when used as a tag/rap line. It’s available in: 9mm, 10.5mm, 11.5mm, 12.5mm, for roughly a dollar per foot. Since this rope just came out, we haven’t been able to find it at any of our normal retailers. We did find it at Sherrill Tree though. Not interested in static ropes?